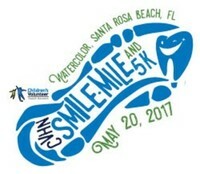 Children’s Volunteer Health Network (CVHN) will host their inaugural Smile Mile and 5K Race presented by St. Joe Community Foundation. The race will take place at 8:00 a.m. with staggered flight start times on Saturday, May 20, 2017 at Watercolor in Santa Rosa Beach. Registration is available before the race online and on the day of the race beginning at 7:00 a.m. This run has a Mile and 5K course. All proceeds benefit Children’s Volunteer Health Network. The "Smile Mile - The Fastest Mile on 30A" start time is 8:00 am at Marina Park in Watercolor. Runners go West on Western Lake, turn right on Buttercup, right onto on 30A. Loop back to make 1 mile course. The 5K start time is 8:30 am at Marina Park in Watercolor. Runners go West on Western Lake, turn right on Buttercup, right onto on 30A. Loop back to make 5K course. Online registration is $20 for a Child and $40 for an Adult. Registration after May 1 is $25 for a Child and $45 for an Adult. Stay for the post race festivities including the Ohana Institute Bands, Max McCann, food, beverages, Epic Photo Co. booth sponsored by Duckies Shop of Fun ~ Seaside, FL and Mercantile ~ Seaside, FL, kids entertainment, prizes and more. Children's Volunteer Health Network, Inc. is a faith-based 501(c)(3) organization, established in 2005 in direct response to Walton and Okaloosa County's large population of low income families who are unable to access high quality health services due to the unavailability (or inadequacy) of insurance. The mission of CVHN is to improve the health and well-being of children in need. CVHN strives towards this mission by utilizing a network of over 95 local volunteer physicians, dentists and other healthcare providers. CVHN also operates the 'Just for Grins' Mobile Dental Clinic that visits local elementary schools and other non-profits, and the CVHN Dental Clinic in Santa Rosa Beach, Florida. All services are free to kids enrolled in school in Walton and Okaloosa Counties who are on the free or reduced lunch programs. CVHN has facilitated more than 68,000 free procedures since inception. Over $5 million in free health services has been provided to our community. CVHN spends 95 cents of every dollar on its programs. The vision of CVHN is for all God’s children to be healthy, happy and see their futures as limitless. Until that day there is more work to be done. For more information, call 850.622.3200 or visit cvhnkids.org. Packet Pickup no later than 7:45 a.m. Strollers welcome! This is a family friendly event! 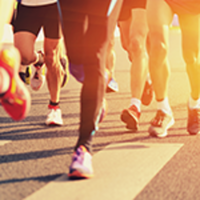 "Smile Mile - The Fastest Mile on 30A" and 5K starts at 8:00 a.m. with staggered flight start times.